DOLLARI MILIONI DI DOLLARI PRESSO CASSE DELLA CROCE ROSSA INTERNAZIONALE. DENARO CHE USANO PER PAGARE CHI INTRAPRENDE IL VIAGGIO 8.000$ A TESTA IL MIGRANTE IN CAMBIO DEVE CONSEGNARE I DOCUMENTI IN MANIERA CHE NON POSSA ESSERE REIMPATRIATO. Breaking News: Our sources exclusively sent us this video of an operation carried out yesterday in a top PDP chieftain’s House. Dozens of boxes of dollars were found locked in Red Cross boxes in two cold rooms. WE WILL NEVER FORGIVE JONATHAN AND PDP! OMG!!! Can you believe this…? Also, note that ICRC is a front for CIA terror !! In a second case, sources told the Panel that physical assets are being kept in Accra, Ghana. At least until February 2016, they were allegedly stored in boxes with an ICRC logo at the premises of an ‘international human rights organization’, Le Comité International pour la Protection des Droits de l’Homme (CIPDH). The Panel has contacted France where the organization has its headquarters. The Panel has seen a report on the matter filed with the Ghanaian police and has subsequently contacted Ghana to ask for clarification. The Panel’s letter, and another reminder, have remained unanswered. 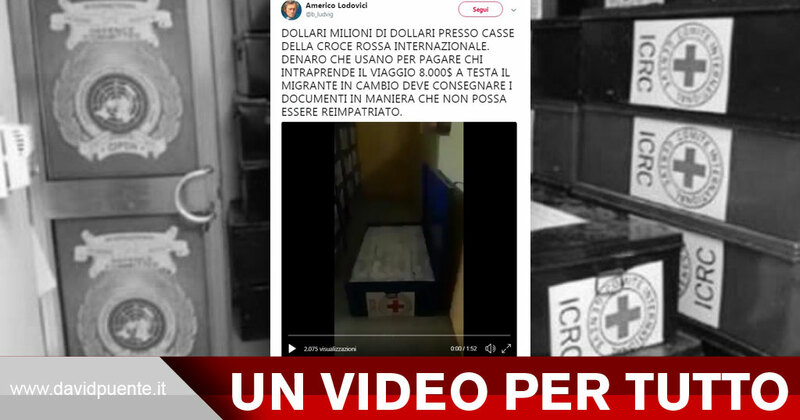 A video showing the illegitimate use of the ICRC emblem on storage trunks holding cash has popped up on social media periodically over the last two years, including in early 2018. We want the following to be understood clearly: The ICRC has nothing whatsoever to do with the storage or transport of cash alleged by this video and we strongly condemn the misuse of our name and logo in this manner. Libia: è una bufala quindi è tutto falso o è una bufala degli haters?